The Spectre 13 x360 that I strangely loved from late last year is back with a 4K screen and pen support for the Windows Creators update that went global this month. There’s also a new EliteBook x360 for enterprise users, with beefed-up security via a fingerprint scanner, Windows Hello and always-on security monitoring for the BIOS. One x360 laptop is better for work, the other for multimedia. Both are some of the best Windows machines out there, but with a few caveats. 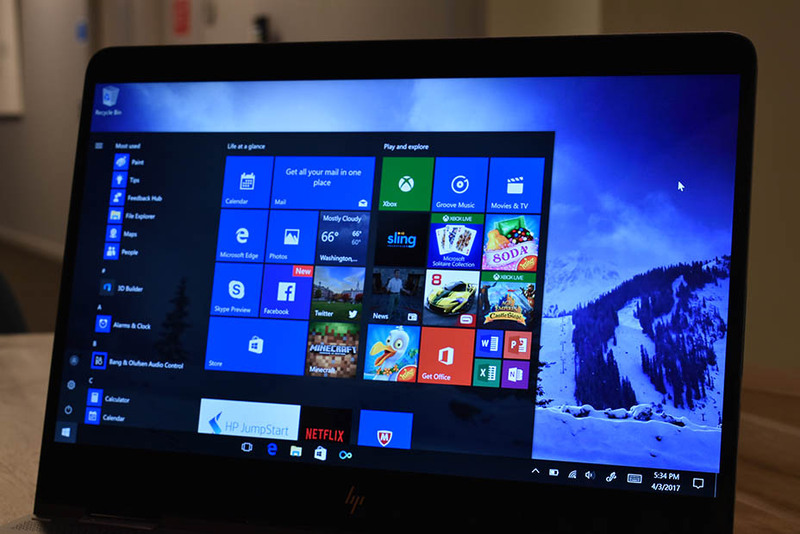 HP EliteBooks are often sold in contracts to corporations or startups that need Windows systems in bulk for their employees. The EliteBook x360 is no different, except we haven’t seen the x360 hinge with a pen before on an EliteBook. The result is a work machine that can be laid flat with its dual microphones for a conference call, but can transform into a tablet with pen support — reminiscent of the Microsoft Surface experience. This functionality is assisted by the Windows Creators update that added Paint 3D, Windows Ink in Photos/Edge and a whole suite of features I previously covered. Specs-wise, the EliteBook x360 is similar to its consumer-oriented counterpart. A Core i7 processor, 16GB of RAM, 512GB SSD, a sharp 1080p HD screen and lots of legacy ports — HDMI-out, microSD, secure card, Kensington lock slot, etc. — are all included. The difference between the EliteBook and the Spectre is most notably: security. But if it’s just a powerful Windows laptop you’re looking for, then the Spectre will suit you just fine. The difference between the EliteBook and the Spectre is most notably: security. Every 15 seconds the BIOS is scanned for tampering. If detected, the EliteBook shuts down and installs a fresh copy of the BIOS. Of course, the whole system is also encrypted and supported by Windows 10 Pro. There are also quite a few ways to lock the system: Windows Hello facial recognition (via infrared camera), a fingerprint sensor or the HP WorkWise app (iOS/Android) that acts as a proximity lock, like the key fob to a Tesla or similar luxury car. Battery life is solid, ranging from 12-15 hours in my personal use. However, your system is really only as secure as your connection to the internet and the services you use. A VPN, good judgement of networks, sites, files and personal network security (or the corporate network managed by an IT manager) is what will decide whether your system gets compromised or not. But fret not: If all of that physical access security isn’t enough, HP partnered with 3M to start shipping EliteBooks with an optional SureView privacy filter. It activates 35 degrees from the center viewpoint, getting brighter, not darker to provide a privacy filter. The downside is you’ll take an hour battery life penalty, but the trade-off is it can be easily activated from the keyboard. 4K and pen support — that’s it? 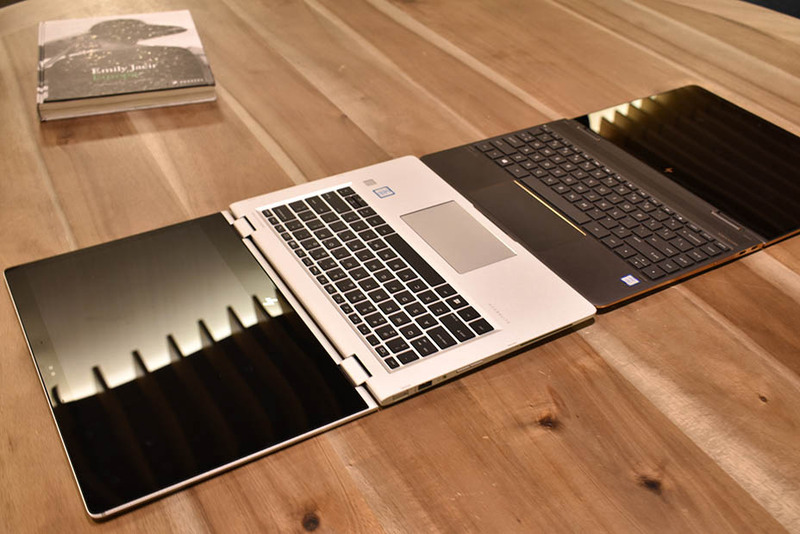 I’m torn with the new Spectre x360: I recommended it wholeheartedly last year, as did a number of other publications. It’s been less than six months and now there’s a 4K option with the same internals. In the real world, having a 4K screen doesn’t offer that much of an advantage over the original model — other than limited high-res content consumption, or if you just like pixels. To top it off, the 13-inch 4K screen doesn’t adhere to any color-grading standard (like Adobe’s, for example), which would make it great for multimedia editing. So it really is just a pretty face, driven by otherwise compelling hardware. However, the quality of the visual upgrade is highly noticeable. The regular full-HD panel looks like an Etch-A-Sketch in comparison. When buying a new laptop like this, you’ll need to ask yourself if trading a few hours of battery life for 3840 x 2160 pixels is worth it — in this case, it really isn’t. While I used to proudly reach 10 hours of usage on the HD Spectre x360, I can only get by 6-7 hours on the 4K model. Time I could have spent working or watching (with content) on a less crisp, but still vibrant and sharp HD screen. In summary, I’d pass on the 4K for the consumer x360 and go for extra security on the enterprise x360. Prices as reviewed: $1,269+ for EliteBook x360, $1,599 for Spectre x360 with 4K.